You may know or have heard somewhere this idea that is the core principle of trance: all hypnosis is self-hypnosis. While it's true that there are countless external sources of stimuli competing for our attention (I live in NYC and can't leave my apartment without instantly seeing more advertising than my brain can consciously comprehend.) it will be our own filters and biases that ultimately decide what we become aware of, what scares or excites us, what "sticks", and what is deleted without a trace. The story we're telling ourselves is the dominant narrative, and the most powerful hypnotist at any given moment is the voice in our heads. Writer's Block, for instance, is a kind of self-defeating, self-perpetuating, state-inducing story about what's not happening that can have in it traces of procrastination, anxiety, laziness, shame, and other corrosive agents. With the writers I work with we'll usually use past life regression early on because past lifetimes or not, the exercise ignites the story-telling machine in our psyche and generates potent living metaphors. 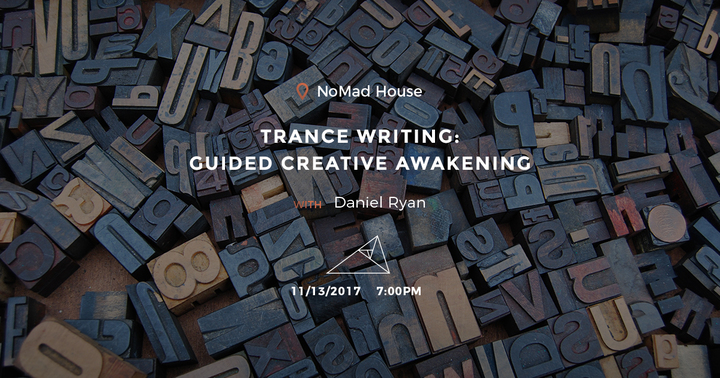 I'm extremely excited to offer Trance Writing: Guided Creative Awakening at the beautiful Assemblage at their NoMad location in Manhattan. During the evening there will be discussion, exercises to induce trance, and time to write. A project or idea currently in development to work with is suggested, but not mandatory. Those looking to discover new ideas will also find benefit. A notebook, pencil, pen, laptop, tablet, quill, ink, scroll, or other writing instrument of your preference. Questions about creativity, its definitions, boundaries, sources, and pollutants.